As we become more dependent on technology, we find ourselves frequently using computers to manage work responsibilities and day- to- day activities. While mobile devices may have supplanted the personal computer as the primary source of online traffic, it still remains the main tool of most offices.One of the defining features of the desktop is the mouse. It provides an easy and convenient way to navigate and perform a number of tasks. Some laptop users prefer to use the mouse over the touch pad which is often difficult to control. Try cutting and pasting using a mouse then switch to a touch pad and you’ll know why the mouse continues to be in demand. There is no doubt that the mouse makes our lives easier but are there down side to overusing a mouse?What Is a Repetitive Stress Injury?Convenience does carry a price. Over the years, more studies have come out addressing the problems of Repetitive Stress Injury or RSI. Doctors often refer to RSI as Cumulative Trauma Disorder or CTD, which in the context of computer- related work is a function of repetitive, forceful or awkward hand movements.Many have experienced RSI in one form or the other when using the computer for a prolonged period of time. Perhaps the most common is Carpal Tunnel Syndrome or CTS, which is a numbing, tingling sensation you feel in your wrist because of consistent pressure on the median nerve. The pressure is caused by repetitive hand position whereby the wrist is always in an extended position. 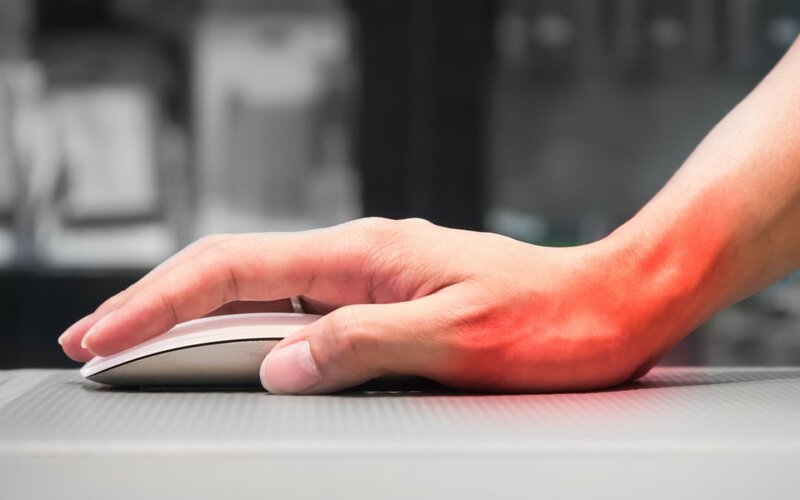 Office workers who use the keyboards for long periods every day are susceptible to CTS and other related injuries.How Can the Mouse Cause RSI?RSI also occurs with frequent use of the mouse. There are two reasons why using the mouse can lead to RSI:1. In order to use the mouse properly, the person must make small but precise movements with their hands, fingers and thumb. It may not seem much but the cumulative effect of positioning, scrolling and clicking the mouse will wear out the muscles, tendons and joints of your hand.Common symptoms include:• Pain on the top of the hand • Pain around the wrist • Pain running along the forearm and elbow • Pain along the joints and tendons • Pain or numbness on the thumb, forefinger or pinky2. Another problem with the mouse is its location. Many workstations are designed to be tight and compact. Since the keyboard is already located in front of its user, the mouse is often placed on the upper right hand corner of the keyboard and toward the back of the work station.When you are forced to reach for the mouse your bodyweight shifts forward and places weight bearing stress on the extended arm. Again, it may seem and feel inconsequential but prolonged periods of time placing stress on the extended arm is unnatural and destructive. It may lead to tendinitis of the wrist, elbow and shoulder.What Is an Ergonomic Mouse and What Are Its Advantages?Many people are not aware that how the mouse fits your hand will determine your risk of RSI. Some buy a mouse that is small thinking it would be easier to use. But a smaller mouse actually requires greater hand control which of course leads to more joint strain.The ergonomic mouse was designed to fit your hand. You can buy it in different sizes and its shape makes it easy and more comfortable to use by bringing your wrist in a natural position. Here are a few of the advantages of using an ergonomic mouse:1. Design presents a more natural grip. 2. Variable sizing means having a mouse that fits snugly in your hand. 3. An ergonomic mouse places your wrist in a more natural position. 4. Moves more efficiently; less movement on the screen and the mouse pad.Bear in mind however, that the ergonomic mouse only decreases pressure on the median nerve. You are still susceptible to RSI if the location of the mouse on your work station continues to force you to reach for it in awkward positions.How Can We Use the Mouse More Effectively and Decrease the Risks of RSI?Switching to ergonomic devices such as the ergonomic mouse is a step in the right direction. However, we should also focus on instituting changes or improvements in our work stations, equipment and daily life to decrease the risks of RSI.Here are 12 tips on using the mouse to greatly reduce the risk of RSI:• Hold the mouse lightly; relax your grip and only use enough force as needed. • Maintain your elbows at a 90-degree angle when typing or when using the mouse. • Use a mouse pad to minimize wrist extension. • Use a mouse bridge; this positions the mouse over the 10- key section of the keyboard. • Locate the mouse beside the keyboard. • Use the larger muscles of the forearms to move the mouse instead of the wrist. • Maintain a neutral position of the wrist when using the mouse. • Take periodic breaks from computer work. Every 30 minutes is advisable. • Stretch the forearm muscles and the wrist joints from time to time by bending your wrist towards the grounds and bringing your fingers towards your body. • Organize your workstation to avoid reaching out in awkward positions. • Exercise your forearm extensor muscles. One cool tric is to grab a rubber band and place it around all your fingers. Try to stretch out the rubber band and your fingers. The pressure from the rubber band will give your forearm extensors a good workout. • Apply ice and perform self-massage therapy in the afflicted area to increase blood flow and help with repair. Techniques can include compressions or friction by performing vigorous circles on the affected area.If you are experiencing discomfort on your wrists or shoulders, you can apply the RICE regimen, which is the acronym for Rest, Ice, Compression and Elevation but you should also seek treatment with your GP or allied health practitioner.Dealing with RSI and its related symptoms are part of everyday life. When we are continually typing away at a keyboard and using a mouse for all our tasks, it is a consistent stressor on our joints and tendons. Implementing a few strategies for improvements and addressing any instances of pain and discomfort is the key to feel better at work. When you are able to work with your computer with less pain and discomfort, the immediate benefit is greater productivity. Making simple adjustments can decrease pain and muscle tension so next time you are at your desk, put in place a safe environment for yourself and you will feel the difference!